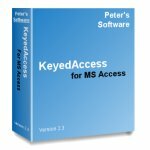 KeyedAccess is an add-on module for Microsoft® Access® that handles product key/unlock code validation, giving you the ability to create secure trial/shareware versions of your Access applications, or to enforce monthly or yearly software license renewal. 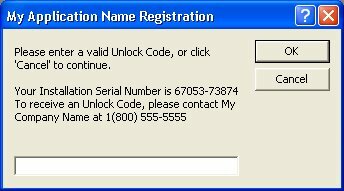 Only a key provided by you will fit the unique lock that KeyedAccess creates on each end-user's computer, and software pirates are prevented from copying, reinstalling, backdating, restoring the registry, or modifying registry keys to get around registration screens. Enforce user licenses in a (non-clustered) Terminal Services environment. KeyedAccess consists entirely of Access objects and VBA code so it is easy to distribute with your Access application. Supports Microsoft® SQL Server®, ADP, as well as Access 97 through 2007, (and Access 2010 and 2013 32 and 64-bit after applying a free patch - just contact us for the patch after you purchase, and we'll send it to you via e-mail. See here for more details). v4.0 - Terminal Services/Citrix Server support (non-clustered), more license renewal options, backdate protection, Vista compatibility bug fixes, Vista compatible help file, misc bug fixes. v3.3 - Fixes a bug that would cause encryption to fail when regional settings specified comma (",") as decimal point instead of period (". "), or something other than a slash ("/") as a date separator. v3.2 - Fixes a bug that allowed a user to bypass KeyedAccess protection in certain instances by deleting a registry key. Supports the 2007 Office system. v3.1, Build 71 - Fixes missing reference problem in KeyeAccess generator when Web Components are not installed. v3.1 - Fixes a problem with Unlock Codes not validating when Bluetooth device is disconnected, fixes a bug with Unlock Codes not validating when no Network Interface Card connected, and fixes a bug where computers with a single NIC would have the Installation Serial Number created using the hard drive serial number instead of the MAC address from the lone NIC. Double-click on the downloaded zip file to open it, then double-click on the setup.exe file inside and follow the instructions on the screen to install this application on your computer. See the included readme.txt file or help file for further instructions on application usage. With the unlimited, royalty-free distribution license, you may incorporate the KeyedAccess code into any number of applications that you develop for distribution inside or outside of your company. 1/9/14 - Access 64-bit support now available after applying a free patch. Registered customers can acquire the patch by request to info@peterssoftware.com. 10/30/08 - Version 4.2 released. 9/10/08 - Version 4.1 released. 9/8/08 - Version 4.0 released. 1/8/07 - Version 3.3 released. 10/10/06 - Version 3.2 released. 7/11/06 - Version 3.1 released. 5/29/06 - Version 3.0 released.